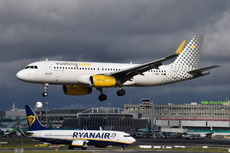 Vueling flight VY1431, an Airbus A320-200, suffered the detachment of the two fan cowls of the no.1 (left) IAE V2527-A5 engine when taking off from Bilbao Airport in Spain. The aircraft took off from runway 12 at 07:07 LT (05:07 UTC). The loss was only noted by the flight crew after the landing of the aircraft at the destination airport at 07:54. Although part of one of the cowls stuck the left main landing gear, the undercarriage was retracted after takeoff, and extended before landing without problems. The aircraft suffered minor damage to the left-hand fuselage where the cowls hit, as well as to the left main landing gear. The incident aircraft had remained overnight at Bilbao. VY1431 was the first flight of the day. This incident is one in over 40 fan cowl loss events involving Airbus A320-family aircraft since 1992.